This is a pattern to crochet 8 pairs of slipper socks. It was published by Leisure Arts in 1994 and is Leaflet number 2612. Sue Penrod designed the patterns. 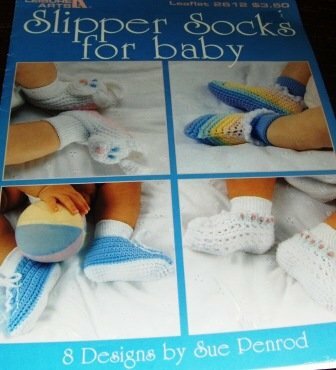 A outer slipper is crocheted and a pair of baby socks is sewn inside. These are a very nice shower gift idea.